Parsi Khabar is saddened to announce the passing away of Dr. Katy Dalal yesterday. 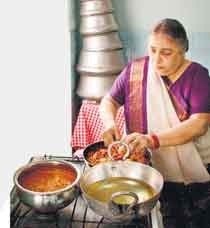 Katy Dalal is legendary for her culinary skills especially with Parsi cuisine. Over the years we as a family have enjoyed wonderful meals ordered from her on festive occassions. She also catered on a lot of the days before both the weddings in our family. Her cookbooks: Jamva Chalo Ji part 1 and 2 are something I cherish and use regularly to make everything from a very authentic dhansak to malido. Besides being a culinary maestro, she was a PhD in Nutrition. Its a big loss to the community and we hope that her son Kurush continues her tradition of catering lip smacking food in the years to come. Our condolences to Kurush and the entire Dalal family on this great loss. What’s cooking in Katy Dalal’s kitchen? The next few days are going to be exhausting enough for Katy Dalal to crave a quick dose of energy from her great grandmother Soonamai’s fresh Limboo Sharbat. But the woman is no more, neither is the limboo tree that once stood in her Tadgaon home front-yard. bottomed terracota vessels balancing over hot red wood in the village kitchens of Sanjan and Bharuch in coastal Gujarat. Hailing from a family of good cooks, Dalal breaks into a smug smile when she tells you that she inherited the art. But it’s also about instinct, believes the lady who grew to become one of the most popular caterers with the Parsis, quite by "accident at sea". With her husband Feroze, a radio officer with the Merchant Navy, Dalal was at sea when they caught a 14-foot shark. With insipid vegetable stew as the only dish to look forward to, the captain requested her to cook the fish. And she was the star of the day. With a retina operation confining Dalal to her home, relatives and neighbours approached her with daily requests to whip up a scrumptious meal. "I started with a single tiffin box," laughs Dalal who went on to cater for the Freemason’s Lodge, Ripon Club, and now, for lavish weddings and navjotes. "To be a good caterer, you have to cook well. But I think it’s more important that you have a large heart. You have to enjoy seeing others eat," she confesses, making a last ditch effort to get me to try her Chicken Celery Sandwich. And that’s probably why afternoons spent lounging in cane chairs at Princess Victoria Mary Gymkhana’s sprawling pavilion, watching the amber stream of mint tea settle in her Chinaware, as her cooks delivered crisp Prawn Kebabs to their table, are a favourite. The sounds of silence that envelop the air around the pavilion would buzz with curious whisper as Dalal held court with a legendary anecdote about the last Persian emperor Yazdezard Sheriar’s Sassanian army’s defeat by Arabs in 64 AD at Nehavand. The crisp crackle of a potato chip by Mrs Birdy sounded the death-knell for Yazdezard’s fortunes. "That was it, it was all over. The Arabs were merciless, it was either conversion or death. About 100,000 of them led by Yazdezard’s son Feroze, fled across lost Sassanian lands into China. Here, Feroze was given sanctuary by the emperor. Can you believe this! He went to become a captain in the Chinese army, and even built an agiary there," she’d recount. But that chatter will have to wait. For now, it’s serious business. The bawas of Mumbai are famished. And Dalal has quite a task on hand.